If you're looking for the Thankful Blog Hop, then click HERE. WOW! What a beautiful morning to wake up to! if there were two of me! LOL!! Seriously! It's always a great day when I get to create and play with paper and stamps. There's no better reason than a great challenge, and this week, The Peachy Keen Challenge Blog has got the ever popular "Anything Goes Challenge" to play along with. Here's the card I created for the current challenge. This adorable little deer image is from the newly released PKSC-11 November 2012 Stamp of the Month set. 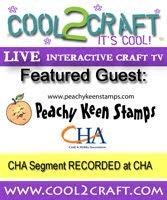 Drop by The Peachy Keen Stamps Store to find out how to subscribe and save BIG on these Stamp of the Month sets. They are AWESOME!! I used products that are part of this month's Peachy Picks Kit for the rest of the card, and that includes the card stock, patterned paper, and ribbon. Those kits are a wonderful thing! I just LOVE 'em!! I colored this reindeer cutie with Copic markers, and he's popped up on the card with some foam dimensionals. I simply cut a piece of rhinestone swirl to make the smoke from the chimney have some sparkle and bling. I'm sharing this card over on The Peachy Keen Connection as a part of Challenge #2 (Use snow/snowflakes) for the Release Party festivities. It might be a stretch, but there IS snow/snowflakes in the background of that paper! ;-) You have till Sunday to play along with the two challenges for a chance to win free stamps and a $50 gift certificate. You can find quick links to the party and challenges on the main page. There's a GREAT tag challenge there, too! Lots of fun and SO many inspiring creations! Join the fun today!! If you're looking for more places to find inspiration, and a chance to win a great prize, then hop along with us for our THANKFUL BLOG HOP. You have till Sunday to join in all that fun as well, and there are three $50 gift certificates hidden in that hop. Winners will be drawn from the comments on ALL of the blogs included in the hop! Don't miss it! Our PKS Designers, both past and present have created some really amazing things for this hop, so it's a "WIN" regardless! Hope to see you there!!! Now that I've left you with so many places to visit and with so many chances to win, I'll wish you a beautiful day, and wonderful weekend, and lots of happy stamping! Such a beautiful Christmas card! LOVE that reindeer and of course your gorgeous coloring!! This card is a hit! Your deer looks so soft... I want to pet him! Exquisite coloring my friend! Wonderful job and the antlers look fabulous! Lorie, this is fabulous! Love the rhinestone smoke out of the chimney! Can I please take you home with me - just until you can teach me to color like you. Your Coloring is Amazing my friend. That deer looks so Real. Love it. Miss you all lots but hopefully life will settle and slow a bit and I can finally get back to some crafting! oooooh, I love that stamp! And of course your coloring is tdf, my friend! Gorgeous! How cute! I absolutely love your reindeer and great coloring! Oh Lorie, what a BEAUTIFUL deer!!!. Gorgeous card!!! Well done!!! Super cute! Love the smoky bling coming out of the chimney! Your card is so beautiful! I love the sparkle & ribbon you used...very nice work Hun & TFS!!! PKS Challenge 45 :: Just Cards :: Shape It Up! Sweet Little Snowman & A BIG SALE! !